Andy: This is a decent silver rum. It’s inexpensive and much better than the Bacardi crap. It doesn’t have too harsh of an alcohol burn but it does have a harsh smell to it. Definitely would make a decent mixer. If you are looking for a decent silver rum to mix with cola or in a fruity beverage, this would be a good, inexpensive choice. Not the best, but certainly not the worst. 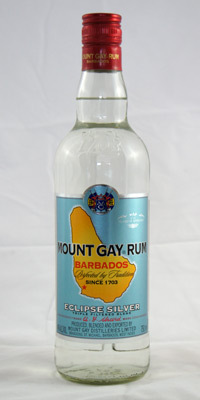 Adrian: The Mount Gay Eclipse Silver has a really light and refreshing flavor when sipped over ice. The smell, however, leads you to believe it’s going to be harsher than it really turns out. With coke, this is exactly what you expect a rum and coke to taste like. A staple for any home bar.